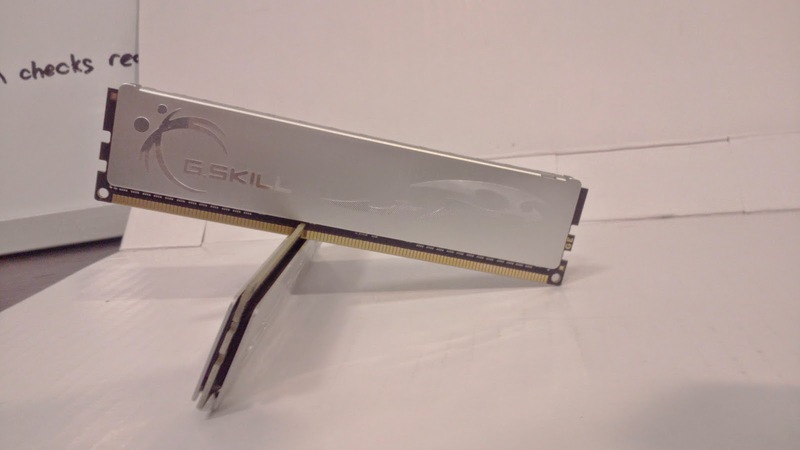 Not long ago I bought a G.skill ECO 2x2GB 1333 7-7-7-21 1.35V ram kit. Now the stock settings on the kit may not sound like much but these things are great. 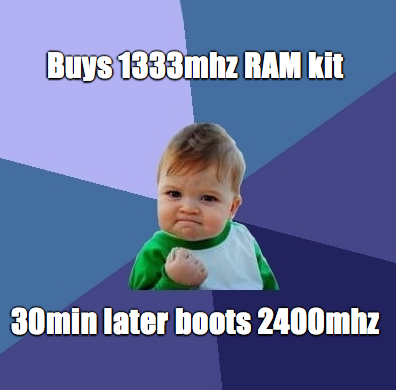 Within 35 minutes of playing with them I had them booting 2400mhz. With better timings than many 2400mhz that you will find available in stores. Now they were not the miracles that I wanted because these sticks use PSC ICs and those are know to do as much as 2600 8-12-8-28 @ 1.85V on air cooling. Now this was early testing so I wasn't pushing very high voltages but it is very obvious that I have a pretty bad PSC kit. The settings I ended up with were 2400mhz 10-12-11-33-1T with sub timings of 5-160-12-6-24-6-7 and 1-1-1-1-3-3-2-1-3-1 using 1.75V. The primary timings are pretty bad as they are barely better than my 24/7 sticks which do 2400 10-12-12-34-2T. However the secondaries and tertiaries are pretty damn good. I hope that I can get this kit to run CL 9/8/7 above 2400-2000mhz since that should put them way ahead of my 2000mhz 8-9-8-24 Ballistix Elite that got me my Super Pi 32M record. I will have more updates after I'm done with the kit. My plans for this kit are to see how high and how low it can go. Now frequencies above 2400mhz are really problematic for the IMC on Sandybridge-e CPUs so I doubt I will hit above 2500 even if the sticks are capable of that. However what I'm more intrested in is just how low I can take the CL because a low CL from my experience is key to getting a HWbot prime score so if these sticks could boot CL6/5 at 1333-1600mhz that be great. The kit is optimal at 2333 9-12-11-32-1T with secondaries of 5-156-12-6-24-6-6 using 1.8V. I still haven't done any benching with these because I need to setup my new benching HDD. I still have to try top the frequency and try the low CL(5,6,7) max clock before doing a full write up this weekend.